Make Some Noise! Getting people’s attention and keeping it is a workshop at Brixton Community Base on Saturday 15 September run by Project Dirt and Eden Project Communities. Food courtesy of Brixton Pound Café. Tickets are free but there’s a refundable £5 deposit because of limited spaces. Make Some Noise in Brixton is for any community projects, leaders, activists and volunteers who would like to learn how to get people’s attention and keep it. It follows on from the success of Offline Festival. 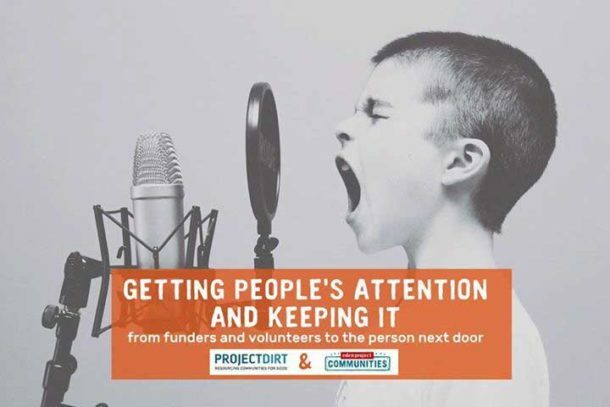 Project Dirt says: “We’ll be sharing tips and tricks to use press, social media and other tools to help projects get their hard work noticed and get support from corporate funders, volunteers and your community. 4.45 Workshop – Keeping people’s attention You’ve learnt how to grab attention, now let’s keep it! Second round of group-led 20 mins slot discussions facilitated by experienced professionals. A fast fun way to make connections and share experience. Break out space. Continue your conversations and get to know each other. 17.15 That’s a wrap. Closing session.